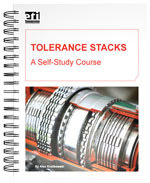 Proficiency in tolerance accumulation studies (also called stacks) separates the exceptional engineers from the rest. More than simply the study of dimensional relationships within assemblies, tolerance stacks are the key to creating robust, efficient, and successful designs. Stacks skills separate the exceptional engineers from the rest. For the first time, these skills are available in a self-study format. If you’re a designer–or a product or process engineer–this course will enhance your career. The course includes 39 performance objectives to be mastered and more than 50 practice stacks to calculate. The Stacks Applications Workbook contains 25 practice stacks that will enhance your skills in optimizing part designs by choosing design goals. The detailed help section reveals hints, partial answers, and total solutions as needed. It also contains a personal progress chart and complete solutions for all tests, problems, and quizzes. The Drawing Package details two complete product designs to analyze. This package is a resource that will pay dividends for years to come. Program Goal: Calculate stacks in drawings using coordinate dimensioning and geometric tolerancing controls. Use stacks to create designs that maximize fit, function, and return on investment. Optimize part tolerances for design function and manufacturing processes. This product is a valuable tool for: Intended as a course in geometric tolerancing, this is primarily for engineers, designers, inspectors, process engineers, machine builders, and anyone with an engineering-oriented quality function. Stacks are taught from a mathematical basis, so that all tolerances can be accounted for. Skill level needed: Students should have basic blueprint reading skills and have completed courses in GD&T fundamentals and advanced concepts. Product highlights: Stresses applications that are found on the job in real-life industrial situations. The practice stacks are from actual drawings that are provided in a separate Drawing Package. It includes a skills assessment tool and exercises at the end of each chapter to practice the concepts. Drawing Package – A spiral-bound booklet containing two complete product designs to analyze. Format: Includes 39 performance objectives to be mastered and over 50 practice stacks to calculate. Why do we need Geometric Dimensioning and Tolerancing (GD&T)? GD&T will save your company money by providing consistent interpretations, increasing manufacturing tolerances and promoting efficiency and quality throughout the engineering, manufacturing and quality functions.